(New Britain, Conn., Feb. 27, 2017) - New Britain Bees team officials today announced that the team has re-signed first baseman Jon Griffin for the 2017 season. 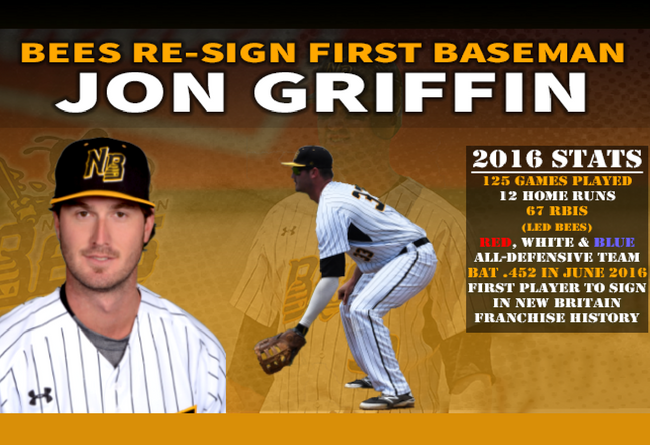 Griffin, who was the first player signed in team history during the 2016 offseason, becomes the ninth player to sign with the Bees in 2017, and the seventh to return to New Britain after the 2016 inaugural season. Griffin, 27, was acquired last offseason from the Long Island Ducks in exchange for pitcher Dan Blewett on February 18th, 2016, and signed with the Bees later that day to become the first player in New Britain franchise history. The 6-foot-6, 230 lbs first baseman drove in 67 runs to lead the Bees, while bashing 12 home runs in 125 games played. Griffin was particularly hot in the month of June, batting .452, and finished the year with a .274 overall average. Griffin was honored by the Atlantic League of Professional Baseball for his defense at first base as a member of the 2016 Red, White and Blue All-Defensive Team, along with teammate James Skelton. Griffin was drafted in three separate MLB Amateur Drafts before signing with the Arizona Diamondbacks after being selected in the 21st round of the 2011 draft. The first baseman spent four seasons in the Arizona system, reaching the Double A level in 2014 where he was a Southern League All-Star for the Mobile BayBears. This will be Griffin’s third season in the Atlantic League, where he has hit 25 home runs and driven in 125 runs in 217 games between Long Island and New Britain.